With harvest in full swing around the state, contributing photographer Richard Duval is always on the road, looking to capture images of great wines in the making. Last week, he touched down in the Columbia Gorge hamlet of Lyle, home to Syncline Wine Cellars. As luck, the calendar, and the harvest gods would have it, he arrived on the day of Syncline’s harvest of its Nelson Vineyard Syrah. 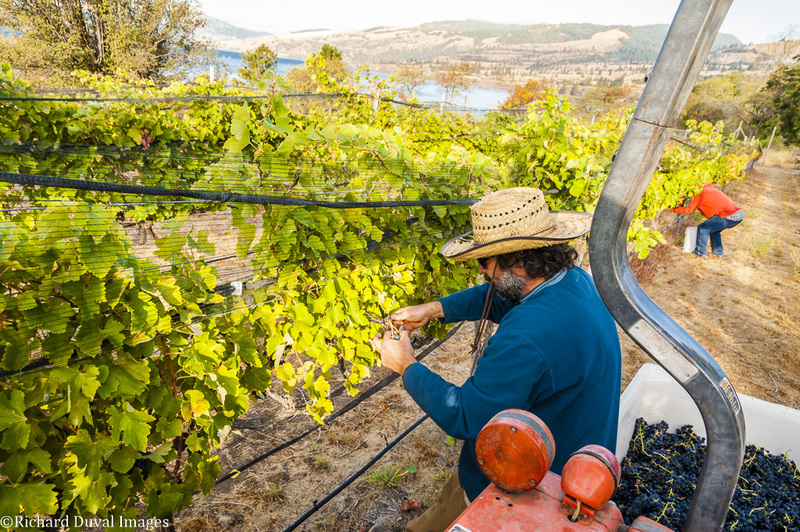 A site Duval first visited four years ago when it was still in its infancy, the three-acre vineyard is nestled on the banks of the Columbia River. Duval notes, “a stroll through the rows brings quick notice of that relentless Gorge wind so adored by windsurfers." The visual effect on the vines—all leaning southeast—is unmistakable. Click on the picture to see a larger image. See previous Pic of the Vine images here.